Is it Organized or is it Camouflaged? 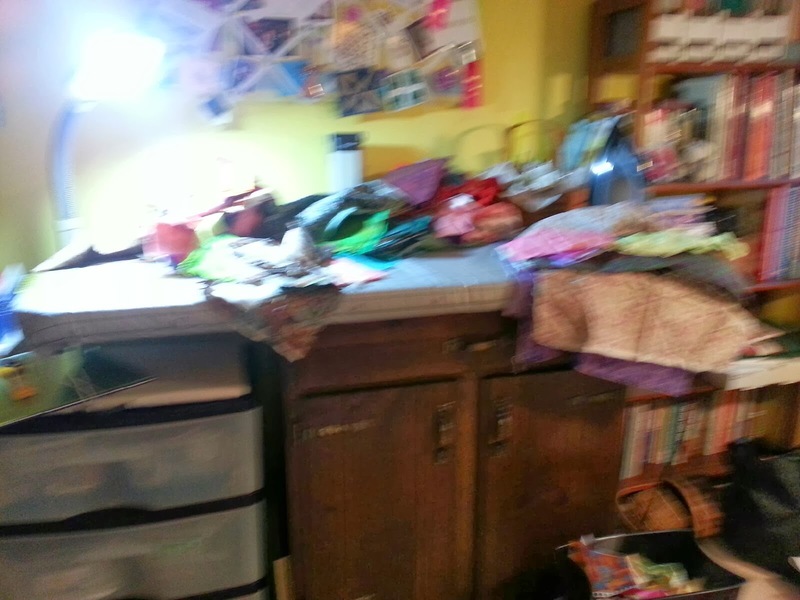 If you blink, you missed it…the sewing room was organized for about an hour or so last week…but the new found sense of freedom has unleashed a creative frenzy. And in that frenzy, I have been pondering some of the newfound insights this version of the re-do has brought forth. 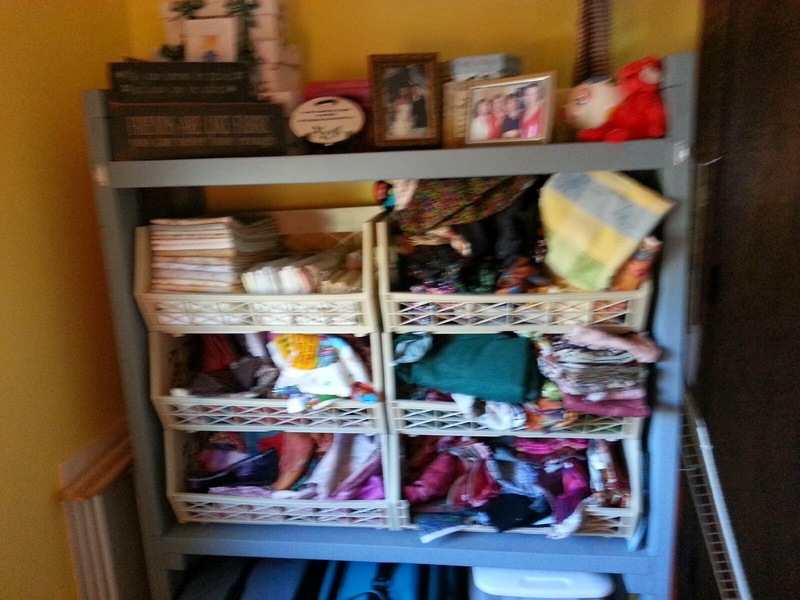 I’ve been quite surprised to read as many quilters on Facebook mentioning a sewing room redesign/cleanup in December as I have. Earlier in the process, I thought I was the only one who was crazed enough to tackle a project of this size this month…apparently, I’m in very good company. I’m of the opinion that we all need to take January off. I know the first picture below is blurry…your photographer had had too much caffeine. Before I started this makeover/rescue project (like that name? ), I would take a project, or a potential project, pull fabric from the stash, the project instructions, whatever other embellishments struck my fancy, put them into one of my bins, label it (at least I did that!) and then put the bin into the closet. That might sound efficient – but the system fails when the potential projects begin to celebrate birthdays. And (unless you look into the bins on a regular basis), you forget what is in there. Lather, rinse repeat that failed system…and I had a totally dysfunctional stash. I couldn’t find anything I had, and I was blocked creatively. I knew I had fabric, or a given project – I just couldn’t find it, and it was a pain to look for it. So here’s where I did a complete overhaul – I took a completely honest look at the Project pile and made a decision to finish it – or repurpose it somehow. I am fortunate to belong to 3 different guilds, and each of their charity projects received donations; I also have a sister in law who’s a newbie quilter, so in that case, I texted her to ask what colors she was collecting in her stash, and shared the wealth with her. It seemed so much easier to look at the rest of the room without the guilt that I was carrying around. The projects to be finished are now easily accessible…and they’re going into the calendar. I did not say into 2014 or 2015…but they are going into the calendar. I took apart two projects, reclaimed the fabric and moved on to the fabric part of the collection. The first thing I learned is that I am NOT a fat quarter kind of gal…by looking at the picture of the new shelves that were installed, it’s pretty obvious that I’m into yardage. I do have a secondary storage unit here in the office, which has three drawers. 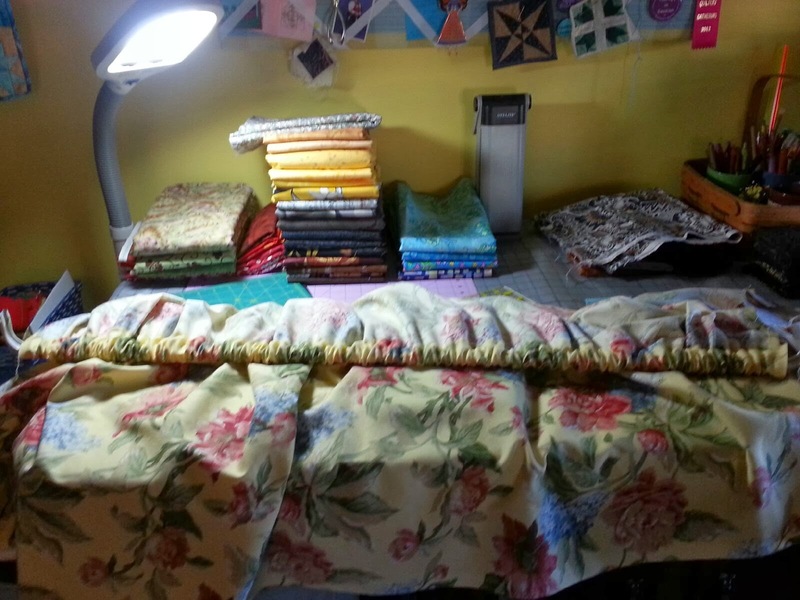 I split that space between my fat quarter collection for cottons, and my batik yardage. The good news is that if I had spent my dollars in fat quarters, the stash would be four times the size…and beyond what the space can handle. I love yardage…I refuse to think there’s a downside. I folded ALL the yardage in the space using my 6 x 24 inch ruler as a guide. It gave me the opportunity to stack and sort the various hues in the stash in a uniform manner. For both the batiks and the cottons, I did sort the yardage into one yard cuts and two yard cuts…for some reason, there is very little middle ground. Once I put the fabric into the new shelves, I could see the ‘holes’ in the color wheel. That was the biggest indication of the changes I saw in how I use the stash…I also saw the fabric I have in a whole new light. I saw tons of teal, but little navy; lots of green, but no purple. It turns out, I do have a lot of purple in the fats, but not in the yardage – before this, I wouldn’t have known that. Come back next week for the rest of the story…I have a quilt (that I started when I redid the room) to bind today. Enjoy!